Homepage. 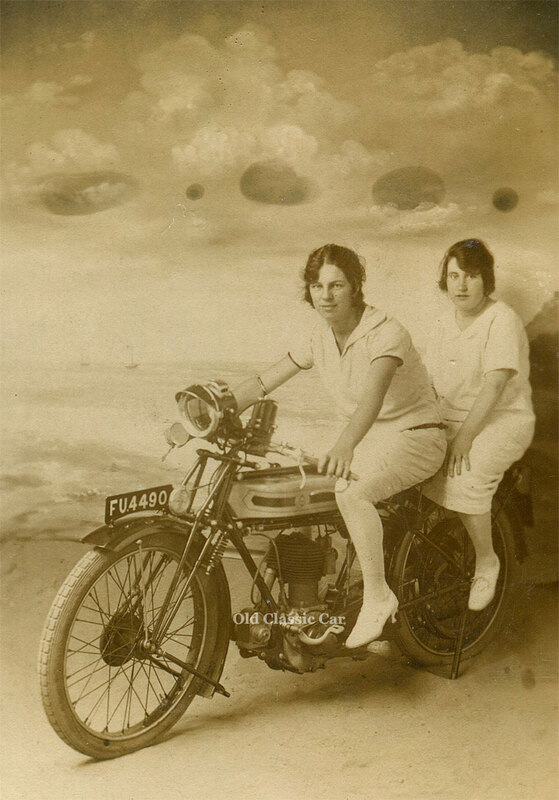 This page: Various old motorcycles that feature in original old photos from the 1910s-1930s. 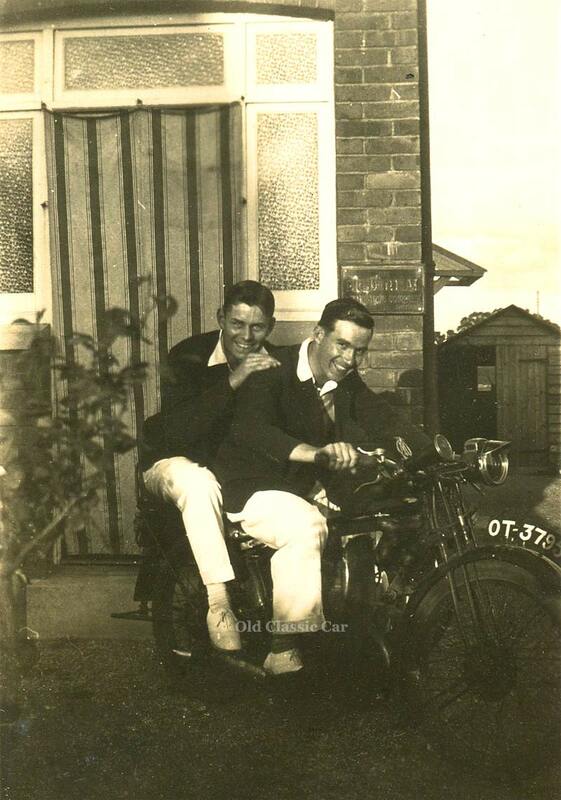 Many of the old motorcycle-related photos I've turned up over the years now feature in here, the image archive section of OCC (Old Classic Car). 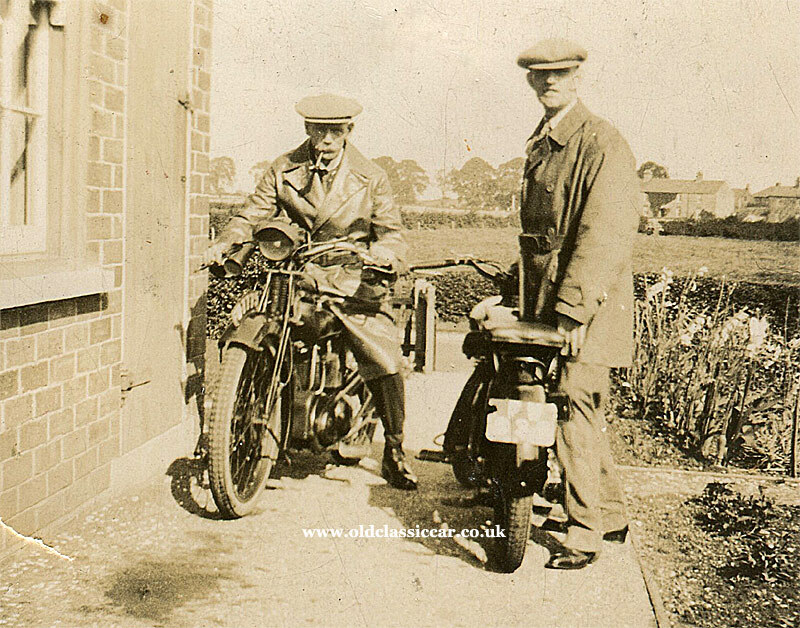 A link to the images index is given at the foot of this page, where you'll find links to period photos of various BSAs, Nortons, Scotts, Velocettes and Triumphs, plus the occasional Indian, Levis, and even a motor-powered tricycle. Pages of sidecar photographs may also be found there. 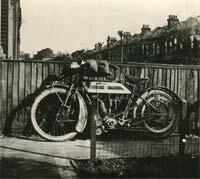 This page will focus on very early (ie vintage/veteran) motorcycles, machines that have yet to be firmly identified. 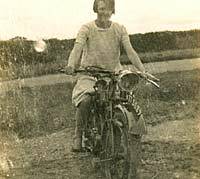 If you know your classic and vintage bikes, and can help with identifications for the pre-war motorcycles shown below, please drop me a line and I'll update the page. 1. 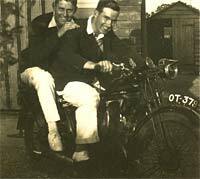 Two motorcyclists and their vintage machines. A sepia snapshot probably from the 1920's opens this page. 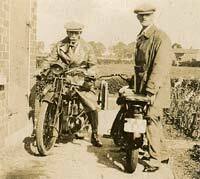 Two motorcyclists in their riding overalls and flat caps, stand by their (as-yet unidentified) bikes. Perhaps they were preparing to go out for a Sunday afternoon's blast down the lanes, stopping for a swift refresher at an out-of-the-way public house, or maybe they'd just returned from a ride out. No notes accompany the photograph, although judging by the age difference of the two gents, it may well be a father-and-son shot. 2. 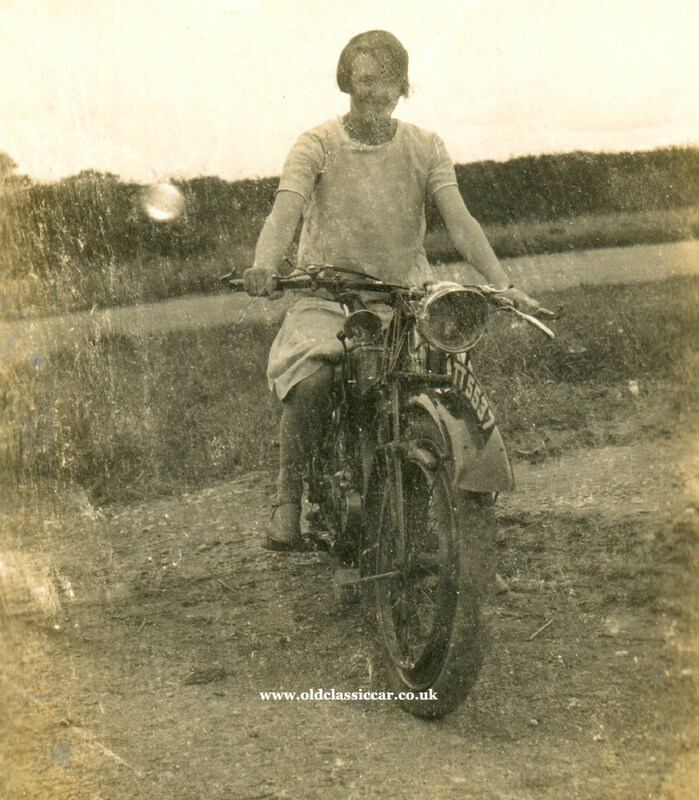 A lady rides pillion - on a Triumph perhaps? Again two people are in the photo, this time though there's just the one motorcycle, with a hatted gent up front and a smiling lady sat "riding" pillion behind him (although the bike is actually up on its stand). 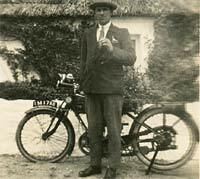 RI 697 is the motorcycle's registration - this is a Dublin (Ireland) series that first went into use in 1903, and continued right through until 1921. It looks like it could be a Triumph to me, but as there were many different versions available I'd like to pin down the make and model with more certainty if possible. Frustratingly, on the reverse of this old photo is an extensive description of the scene - but alas it was stuck into an album, then removed by the person I bought the photo from, destroying all but the odd word. 3. 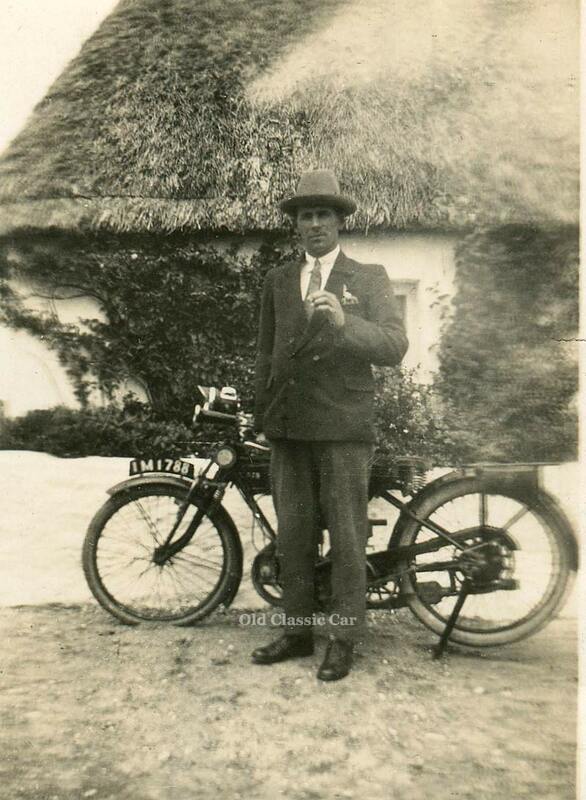 A chap in uniform with his motorcycle. 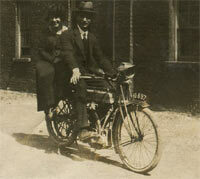 Next, a chap on his own this time, astride his prized machine. Registered PR 1962, it was first used in Dorset. This series ran from January 1923 to December 1927, putting this machine at about 1924 or thereabouts. The rider - no flat cap or other headgear in evidence this time - appears to be wearing a uniform, if the epaulets on his shoulders are anything to go by. 4. Lady and the motorcycle. 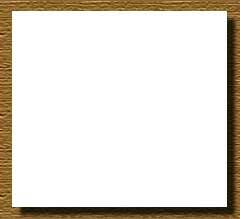 A young lady graces the following photograph. TT 5537 is this bike's registration, a Devon issue that ran from June 1924 to October 1926, putting this bike at around mid-1925 at first glance. Is there enough of the bike visible here to help i.d. it? 5. 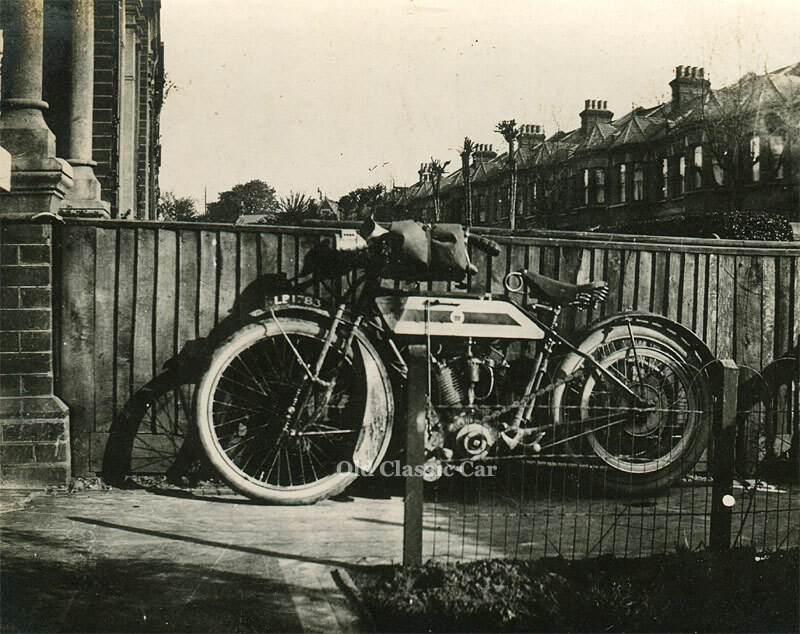 A London-registered motorcycle from 1915. 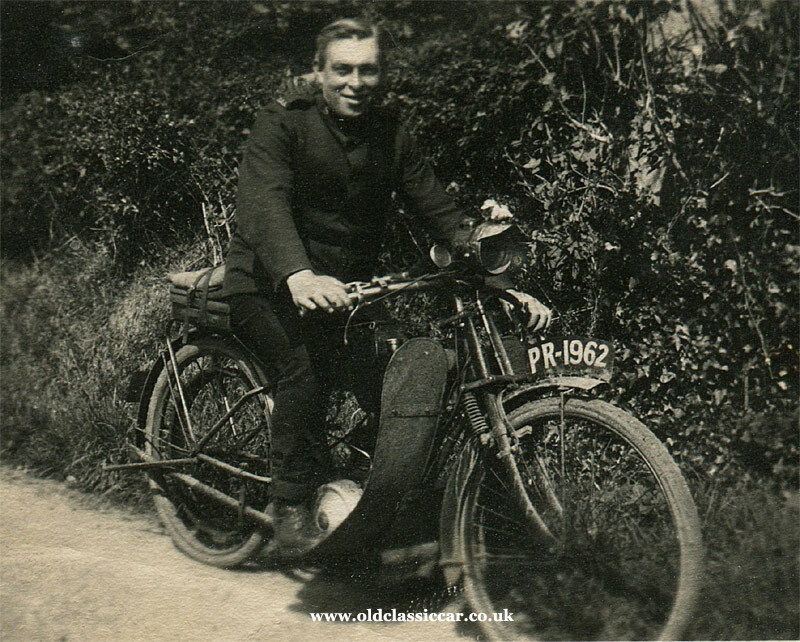 Would many civilian motorcycles have been registered here in Britain during WW1? Whatever LP 1783 was, the very muddy front mudguard suggests regular use in all weathers. Is it a Triumph, V-twin perhaps? 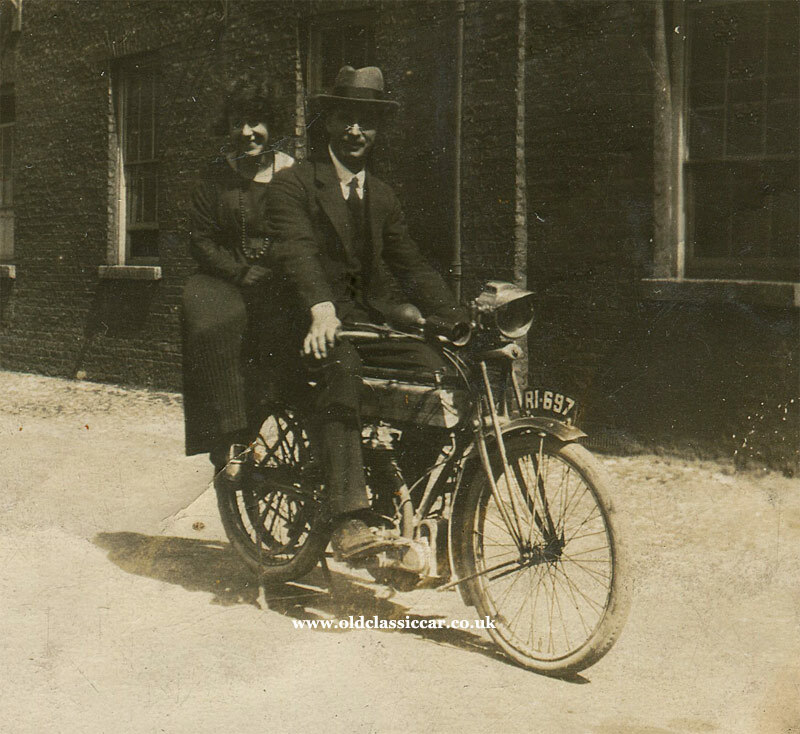 Note the riding gauntlets laying on the handlebars, and the acetylene headlamp. Other than being printed on Velox paper, presumably over 100 years ago, no other information about this bike or its owner is known. 6. 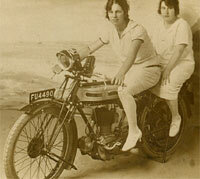 Two ladies astride a vintage Triumph in a studio. Looking very closely at a high-res scan of the following photo, I think reveals the legend "Triumph" on this machine's crankcase. The location is a photographer's studio, in the 1920s. It was quite common for such studios to have a motorcycle, or a small car, posed in front of a painted backdrop, on/in which members of the public could pose for a snapshot. Here, two ladies - named Elsie and Flo Chamberlain - stare, sitting as still as possible, while the camera operator weaves his or her magic behind the lens. FU 4490 is the Triumph's registration, this is a Lindsey (Lincolnshire) issue from the mid-twenties. The motorcycle looks to be in good order, although a few exertions on a foot pump attached to the rear inner tube wouldn't go amiss. 7. Two gents on a ????. 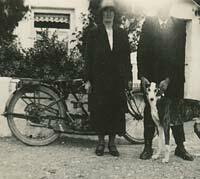 Two speed demons and an unidentified motorcycle, registered OT 3795 in Hampshire circa 1926/1927, are the subjects of the following b&w photo. There is just one clue as the location, attached to the wall of the house behind the two gents. A plaque reads "The Prudential Insurance Company Limited". The building looks more like a domestic house rather than an office, but why would it have a business' name plate next to the front door? The material over the front door opening looks a little odd too. 8. An AJS from the west of Ireland. The following two photographs belong, I think, together. Both were printed by the Auto Snap Service of Dublin, Ireland. They also appear to feature the same motorcycle and, almost definitely, the same building in the background. 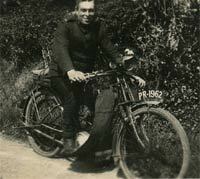 In photograph #1, a gent is posed with motorcycle IM 1788, and close examination reveals the letters "AJS" on its tank. In the background is a thatched cottage, and a wall painted white to match the house. 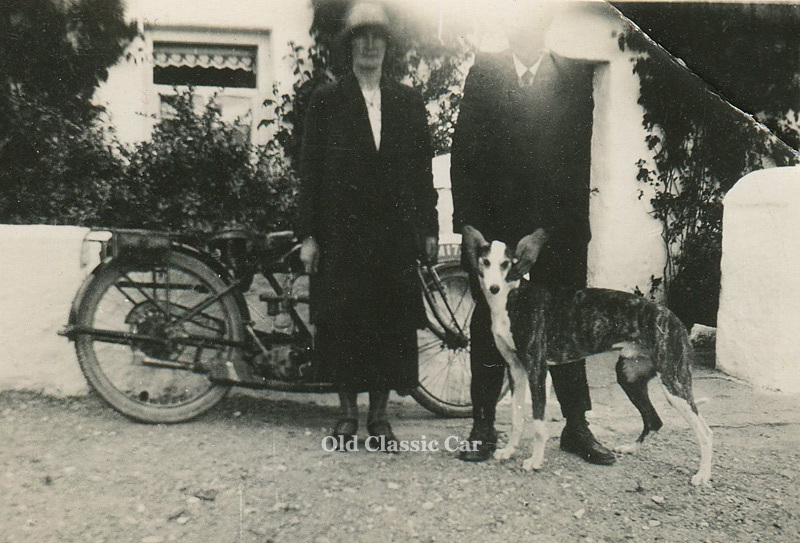 The second image, of a different gent and a lady this time, would appear to have the same motorcycle and cottage as a backdrop. While only "M 17" can be made out on the front registration plate, it must surely be the same 'bike. While the IM registration series belongs to the Galway area of Ireland, there are no notes to say that these photographs were also taken in that area. Even if all the machines shown in the above photos can't be identified 100%, they're fascinating images in their own right so deserve their own spot on the site. If you have any similar photos to these that you're willing to see shared on OCC, please let me know, thanks. I'll be adding in more photos like these soon. Return to Page 20 in the motoring photographs archive, or visit the main index here to view a great many transport-related images. A number of pages across OCC deal with vintage motorcycle matters and memorabilia. They include this page for example, which takes a look at a rare original sales leaflet for Palmer Motor Cycle tyres, dated October 1913.